This is a long overdue post I've had in my drafts for ages. It has also been one of my highest requested posts and I've finally managed to get around to producing it. 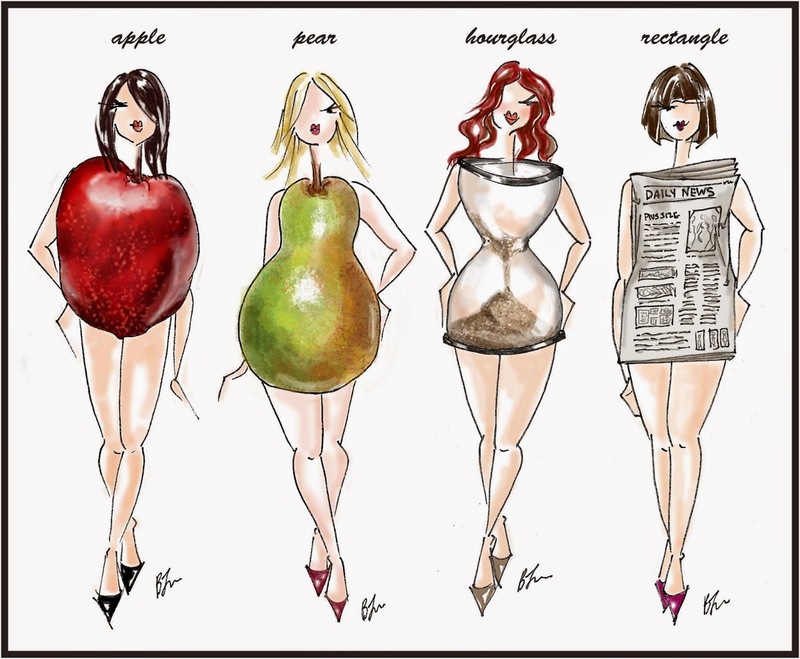 As the title suggests, I will be advising you lovely ladies with a few tips and tricks to dress for your body shape no matter what size you are. If this is exactly what you've been waiting for, I've got a post on finding the best jeans for you next week. I may be skinny, but I still feel quite conscious about my arms. Make sure you stay away from anything that is sleeveless or cap sleeved. You just wont feel comfortable, so wear clothes with bell sleeves, 3/4 length or long sleeved. Not everyone is blessed with huge assests, so to save yourself from looking like a 10 year old boy avoid wearing anything with a deep plunging neckline. Instead, you should choose dresses with a scoop or bandeau neck with details such as lace, sequins etc. Also make good use of statement necklaces. Ladies with big boobies don't make the mistake that many women do by buying the tightest dresses and tops you can find in attempt to make that area look smaller. Instead, choose dresses with halter tops and deep V necks with fabrics that just skim your body. In order to balance your body pair with an A-line skirt that falls just bellow the knee. You want to take focus away from the largest part of your body ( those thighs and hips so it's best to wear dresses that are an A-line fit. For those of you who don't speak fashion, that's something that is tight around the waist and flows like the letter A outwards. Also make sure you wear skirts and dresses that fall at least 2inches above the knee as it cuts at such a flattering length. It's also best to pay attention to your upper body, wear halter necks, necklaces, or something with more cleavage. It's funny how our bodies are compared to fruit. But if you do have this body shape, don't be alarmed or upset, all you need to do to elongate your body is to wear clothes with lower waistlines, and never wear a thick chunky belt, opt for something slimmer and dainty, that way you're still breaking the body into two different sections but it's a lot more subtle. Most plus size ladies tend to layer themselves in baggy clothes in attempt to cover all their gorgeous lumps and bumbs. But that's where you're going wrong, instead you should choose loose fabrics that don't cling to your body, but drape nicely. Go for wrap around dresses and don't fear colour and prints, go all out ladies. I've also found that some ladies like the look of a peplum dress so be sure to try that the next time you're shopping. You lucky ladies can go all out with the layering. Go for a chunky knit dress and add cardigans and fitted jackets to help bulk you up. If you have thin legs try to avoid mini skirts, try wearing more flowy mid-mini to knee length dresses. There are also those bubble dresses (that ironically look like bubbles) as they give the appearance of a larger lower body. The shift is a dress, unlike most is flattering on almost everyone. A shift dress hangs straight down from the shoulder/ neck. It skims your body nicely, but doesn't cling. You can jazz these up with necklaces, but you will find that many already come with bejewelled neck lines. Do you have any tips for dressing for your size? Make sure you leave comments bellow to let others know and don't forget to share this post. This is in no way set out to offend anyone, I hope nobody feels as though this post is attacking them. This post is here to help inform women the best ways to dress to make them feel comfortable and confident. I believe all women shapes and sizes are beautiful, but by dressing a certain way you can make yourself feel 10 times more comfortable and ready to have a good time.